These cleaners are common (and helpful to have around), but the wrong combo can be quite dangerous. When you’re faced with a tough cleaning job, it’s easy to get frustrated — and tempting to get creative with how you combat it. But before you reach for every cleaning product under your sink and start playing chemist, please just don’t. But here’s the scary truth: “Certain products, which are safe when used alone, can sometimes cause unsafe fumes or other chemical reactions when mixed with other products,” says Nancy Bock, Senior VP of Education at the American Cleaning Institute. Use one product according to package directions (typically, only half a bottle is needed per treatment). If it doesn’t work, don’t try another product. Instead, call a plumber, Forte says. We’re calling you out, Pinterest: Although these pantry staples are handy on their own (both baking soda and vinegar can help clean all over the house), skip any DIY cleaner recipe that involves this not-so-dynamic duo. 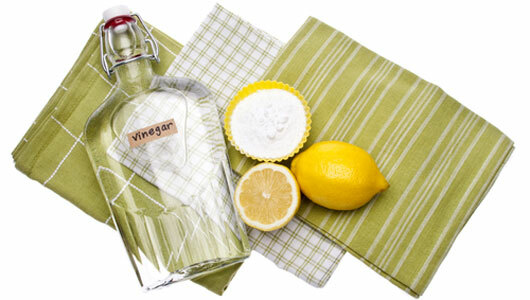 You may have heard that you should spray fruits or countertops with alternating mists of hydrogen peroxide and vinegar, wiping down the surface between sprays. Experts say this method is safe — but don’t mix the two products in the same container. Combining them creates peracetic acid, which is potentially toxic and can irritate the skin, eyes, and respiratory system. The combination sounds like it’d be a powerful disinfectant, but the two should never be mixed. “Together, they produce chlorine gas, which even at low levels, can cause coughing, breathing problems, and burning, watery eyes,” says Forte. Bleach and ammonia produces a toxic gas called chloramine. “It causes the same symptoms as bleach and vinegar — along with shortness of breath and chest pain.” says Forte. Many glass and window cleaners contain ammonia, so never mix those with bleach. Perhaps you’ve heard of chloroform? You know, the stuff kidnappers in the movies put on rags to knock out their victims? Although it might not actually make you pass out, this combination can be irritating and toxic. Make it a rule to never mix bleach with anything but plain water. “Even other products like window and toilet bowl cleaners can have ingredients, like acids or ammonia, that shouldn’t be mixed with bleach,” says Forte.